Sit back and relax in ergonomic splendor in the Humanscale Freedom Chair without Headrest, minus the levers and knobs that are synonymous with most office chairs. The Humanscale Freedom Chair makes huge strides to support your body ideally, giving you superior range of movement while you work at the same time. 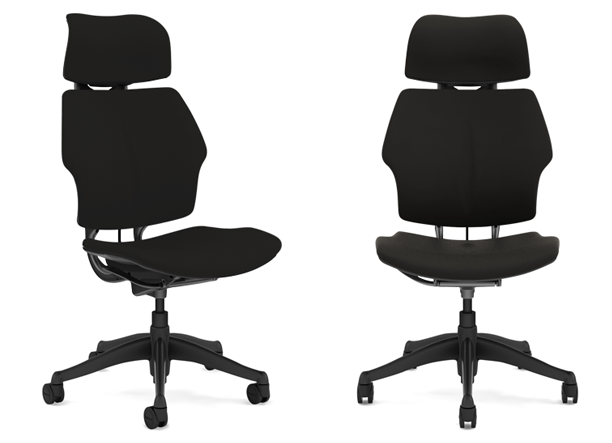 Designed by the ergonomic innovator Niels Diffrient, the seat allows you to tilt, lean, and recline your way to better posture. 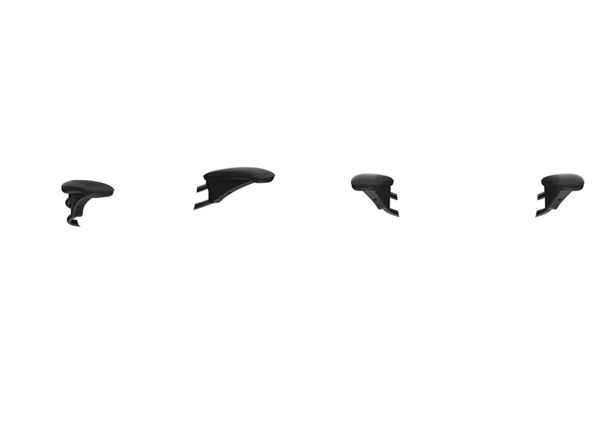 Your productivity will soar as you stop wasting time fidgeting with your seat - just rely on its integrated intuitive counterbalance mechanism to find that sitting sweet spot. The Freedom Chair is customizable to your wants, from alterable arms to upholstery options, giving you and your office a personalized seating solution of the ages. Armrest height 5" - 11"
I've only had this chair a few days but I already love it. Very well built, plenty of simple adjustments and very stylish addition to my home office. I like how the back rest moves with you and supports your lower back in all positions. The wavy fabric I chose is quite comfortable and it feels nice to the hand. The back of the chair has a clever handle on it to aid in pulling the chair out from a desk or moving it around a room rather than having to grab the arm rest or back rest. I chose the gel seat and gel arm rest options as well as the adjustable arm rest option and am very happy with those choices. The only thing I miss over my old Staples chair is the tilting seat so you can tilt back and put your feet up on the desk which is how I often like to browse the web. This seat does not tilt as most cheapy office chairs do, however, it is still comfortable once you find the right position. It was easy to order and fast delivery. Great chair! Very comfortable and easy to adjust. I've had my chair about a week. It was really easy to adjust to my body, and hasn't taken any time to get used to at all. I love that it is was customizable and that the sales person at The Human Solution helped me select exactly what I needed even though I thought I had it pretty well nailed down. The only feature I wish it had was independently adjustable arms. I would like to be able to keep the right one up for support for mousing while sometimes the left might need to be higher, lower, or even not even there. I researched a long time to find everything I needed, and this had it all. I has lived up to it so far. $949.00 List Price: $1,049.00* The list price is the same as the MSRP (Manufacturer's Suggested Retail Price). It may not necessarily be the price at which the product is sold.